Pace Vegas TDC-575D User Review: First Impressions! This is the Pace TDC575D, affectionately(?) called "Vegas". The manufacturer's page along with three PDF user guides/manuals at Page Micro. Please note that these PDF user manuals only cover the device/hardware aspects. The DVR user interface and such are determined by your cable provider, so you will need their user manuals to read about those features/functions. This is a digital-tuner only model and is only available in areas with ADS/rebuilt cable systems. 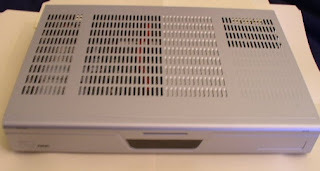 There is another model from Pace called "Tahoe" which is a HD DVR. That is a different model from the one I have. It has One Component video out, One S-Video, one yellow RCA, one red/white Audio output, one RF output, one orange digital audio out and a couple more that I don't know if they are active or what there function is. I went to my local Comcast office and switched the boxes. 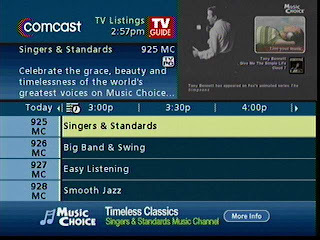 I do not know what the fees are for new customers or new DVR users. They may be different from existing/switching customers. I do not know if you need a digital cable package in order to get the DVR. Check with your provider to be sure. I have Comcast digital cable. During activation of the new box with the help of a telephonic (is that even a word?) customer service representative (CSR), the Comcast CSR told me to temporarily remove the splitter. This is the first time I was told this. I do not know if this has to happen for this box only or I just happened to get a detail-oriented CSR who goes by the book. The CSR did sound very process-oriented and thorough... After the first 45 minutes of activation, then I could re-insert the splitter. It does not have any buttons on the front of the unit. You can only control it with the remote control. There is no power off button on the device. Since this is a standard definition box, you cannot watch high definition channels with it even if they are included in your package. Instead you get a blank screen, but you can hear the audio (if that's any consolation). 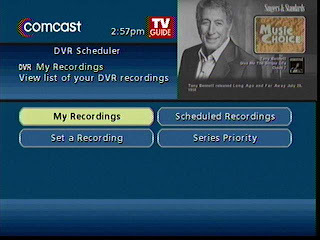 It has the same user interface as the Motorola DVRs (341x/641x) from Comcast. If you have any questions or answers, please leave them as comments! I just rented a Pace also last month. It's my first DVR. Mine a couple of time has registered 100% full, even if there are only a couple of hours stored on it. It will immediately jump from say 4% to 100% and will not record something I have asked it to record. The only way around it is to reboot. Sometimes you have to reboot 4 or 5 times to fix the percentage of disk used to get it back to the correct reading. Hope you do not encounter this error. Thank you for your comments! I read about the 100% full bug in the AVS forums for both the Pace and the Motorolas but I haven't run into that particular bug (yet). Perhaps it's caused by a specific software/firmware version?